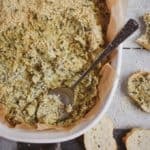 Super simple vegan spinach artichoke dip that will please any crowd. Creamy, hearty, and absolutely delicious. Awesome addition to any party, game day, or solo snacking. Heat a large nonstick skillet over medium-high heat. Add onions and cook with 1-2 Tbsp. of water or veggie stock, if needed to prevent sticking, and cook until soft. Reduce the heat to medium-low, add spinach and cook until spinach is wilted. If using frozen spinach, cook until spinach is warm. After spinach and onions are cooked, remove from heat and set aside. Blend tofu, garlic, nutritional yeast, lemon juice, Italian seasoning and salt in food processor until smooth. You may have to stop and scrape down this sides. Add artichokes and spinach to food processor with tofu mixture and pulse several times until all ingredients are combined. But, leave it a little chunky! Line a small baking dish with parchment paper and add mixture. Bake for 15 minutes. Remove from oven and sprinkle parmesan on top. Place spinach artichoke dip back in oven and bake for 15 minutes. Let it cool for a few minutes and serve with toasted bread, veggies or my healthy Homemade Tortilla Chips. FYI, this is not freezer friendly. However, it will keep in the fridge for a few days.